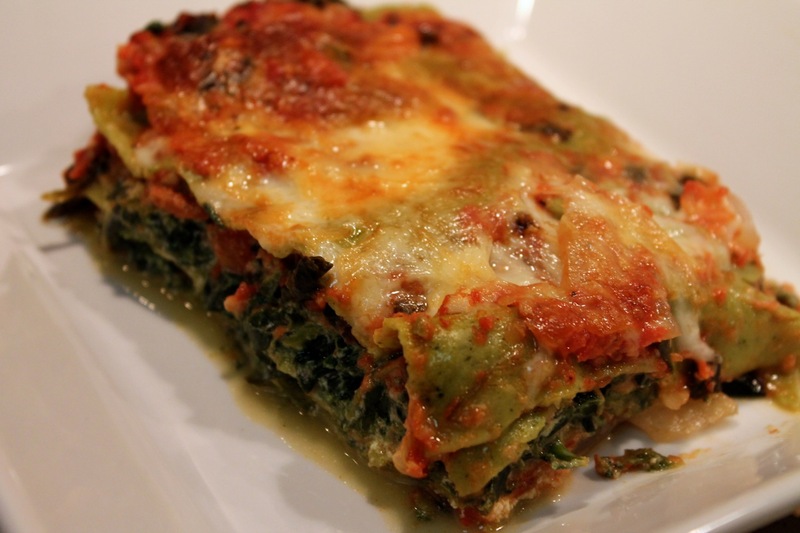 Needing to use up some of the food in my pantry, I searched for a recipe that would take out a couple of big-ticket items: a box of no-boil spinach lasagna noodles from Eataly and a large can of San Marzano peeled tomatoes. 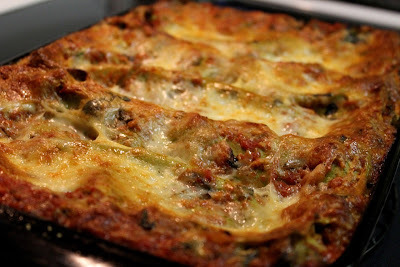 Lasagna is the perfect vehicle for such an enterprise, as its versatility makes it idea for all sorts of ingredients. I also used up some frozen spinach! I adapted this recipe from The Key Ingredient, a recipe sharing site. It's originally from Cook's Country, the rustic Cook's Illustrated offshoot. I substituted a little lean Italian-style chicken sausage for some of the spinach, upped the quality (and reduced the quantity) of ricotta cheese by using fresh instead of part-skim, reduced the parmesan and omitted the eggs. As such, it's a pretty basic lasagna that doesn't require an unusual amount of labor to come together as a tasty, satisfying meal. What hot dish coming out of the oven topped with melted, browned cheese is ever really bad anyway? 3 1/2 lb. of tomatoes (Use fresh, canned or a mix of both: I used half fresh tomatoes and half canned peeled San Marzano tomatoes--which was one 28-oz. can). 2. Cook spinach according to package directions in the microwave. Set aside to cool a bit and then squeeze out any excess moisture, reserving about 1/4 cup of the spinach liquid. 3. Pulse the tomatoes in a food processor until pureed. 4. Heat a large sauté pan over medium heat. Add sausage and cook, stirring occasionally until browned, about 10 minutes. Remove from pan and set aside.2. Add 1 tbsp. olive oil to the pan. When hot, add onion, season with salt and sauté until softened, about 5 minutes. Add garlic, red pepper flakes and pepper and cook another 3-5 minutes. 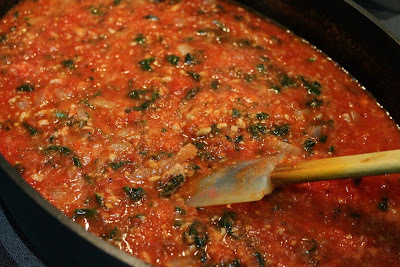 Transfer the pureed tomatoes and 1/2 cup of the drained cooked spinach to the pan and cook over medium heat for about 10 minutes until thickened. Stir in the basil. 5. Add the ricotta, the rest of the spinach, and 2 tbsp. of the reserved spinach liquid to a food processor. Process until smooth. Add additional spinach liquid of the mixture seems too thick to easily spread. 6. Build the lasagna: In a 9 X 13 baking sheet, start by spreading about 1 1/4 cup of the tomato sauce on the bottom. Top with three noodles (lay crosswise and do not overlap noodles), spread 1/3 of the ricotta-spinach mixture on top of the noodles, about 1/4 of the mozzarella, 1/4 of the parmesan and finally another 1 1/4 cup of tomato sauce. Repeat two more times: (noodles, ricotta, cheeses and sauce), then top with the last 3 noodles, any remaining sauce and the remaining cheeses. Bake the lasagna in the oven until the cheese has melted and browned and the lasagna bubbles around the edges, about 40-45 minutes. Remove from oven and allow to cool 5 to 10 minutes before cutting. This was very good. It's fun to see you create new twists on old favorites like lasagna.